SAN JOSE — San Jose Sharks (@sanjosesharks) General Manager Doug Wilson announced that Peter DeBoer (deh-BOHR) has been named the eighth head coach in Sharks franchise history. In keeping with club policy, terms of the contract were not disclosed. This season will mark DeBoer’s 21st consecutive season as a head coach, serving at both the NHL and Canadian Hockey League levels. 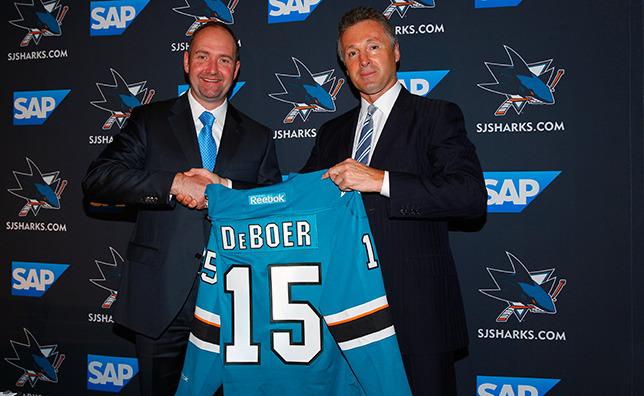 “It’s an honor and privilege to have the opportunity to coach the San Jose Sharks,” said DeBoer. “The Sharks have one of the most energetic buildings in the NHL and I am looking forward to the opportunity to roll up my sleeves and get to work with this group." "I am pleased to see an experienced head coach taking over,” said Sharks Majority Owner Hasso Plattner. “With Peter on board, we can now concentrate on reinforcing our team for the next season and securing the future through the draft." DeBoer, 46, spent the last three-plus seasons as head coach of the New Jersey Devils. In 2011-12, after finishing with 102 points and a 48-28-6 record, he led the team to the Stanley Cup Final, alongside current Sharks Director of Player Development Larry Robinson, who served as assistant coach on DeBoer’s staff. Entering the 2012 playoffs as the sixth seed in the Eastern Conference, DeBoer’s Devils defeated the Southeast Division Champion Florida Panthers in double-overtime of Game 7 in the Eastern Conference Quarterfinals, knocked off the Philadelphia Flyers in five games in the semi-finals and bested the Atlantic Division and Eastern Conference’s top-seeded New York Rangers in the Eastern Conference Finals. The Devils fell to the eventual Stanley Cup Champion Los Angeles Kings in six games. In 248 games coached with New Jersey, DeBoer posted a 114-93-41 record. He ranks as the second-most winningest coach in Devils franchise history, behind only Jacques Lemaire. Prior to coaching in New Jersey, DeBoer spent three seasons as head coach of the Florida Panthers. In 2008-09, his first season as an NHL head coach, he coached the Panthers to their then second-best season in franchise history with 93 points, posting a 41-30-11 record. The team tied the Montreal Canadiens for eighth place in the Eastern Conference but lost the tie-breaker to the Canadiens for the final playoff position. In 246 games coached with Florida, DeBoer posted a 103-107-36 record. A veteran of nearly 500 NHL games, DeBoer’s overall NHL coaching record with New Jersey and Florida stands at 217-200-77. Prior to coaching in the NHL, DeBoer was one of the most distinguished coaches in the Ontario Hockey League’s history. He spent 13 seasons coaching with Detroit, Plymouth and Kitchener in the OHL, including winning a Memorial Cup Championship in 2003 and the OHL Championship in 2003 and 2008 with Kitchener. A two-time winner of the OHL Coach of the Year Award in 1999 and 2000 with Plymouth, he was also named the Canadian Hockey League’s Coach of the Year in 2000. During his time in the OHL, he led his team to the league’s best overall record four times (1998-99, 1999-2000, 2002-03, 2007-08) and is one of only eight coaches in OHL history to reach the 500+ win mark. He ranks eighth on the OHL all-time coaches win list (539) and 12th in games coached (878). Internationally, DeBoer has frequently been selected to represent his native Canada, including serving as an assistant coach for the Canadian World Championship squad in 2015 (gold medal), 2014 and 2010. Additionally, he was a member of the coaching staff for Canada’s World Junior Championship team in 2005 (gold medal) and 1998. He also served on the Team Canada coaching staff for the 2007 Canada-Russia Super Series. DeBoer was selected by the Toronto Maple Leafs in the 1988 NHL Draft (12th round, 237th overall) while playing for the Windsor Spitfires (OHL). He played three seasons (1989-1991) professionally with the Milwaukee Admirals of the International Hockey League. DeBoer holds a law degree from the University of Windsor and University of Detroit through the Dual J.D. Program. He and his wife, Susan, have three children.